The quickest way to fame today is to be outrageous. With social media and 24-7 news cycles, everyone has a shot at their 15 minutes of fame and the possibility that they can “cash in” on their celebrity status. What passes for “news” is yesteryear’s gossip. When I was a kid, drug addiction, infidelity and divorce didn’t make you famous, it made you infamous. The path to notoriety today is simple: do or say something stupid and make sure there is video of your antics and hope it goes viral. The more shocking your conduct, the more likely it will be noticed and you will be projected into the limelight (actually limelights were replaced by electric lights in theaters in the late 19th century). In the 1940s to the 1960s many jazz musicians did a lot of stupid things, especially taking drugs, but their goal was to get high, not get caught. The last thing a jazz musician wanted was to get busted or be known as a drug user since drug use could lead to unemployment in NYC because of the revocation of your “cabaret card.” Many musicians did get busted and the public’s perception of the world of jazz, which was never very high due to its earthy origins and the early venues it was performed in (whorehouses and later speakeasies), suffered even more. It is true that many of the jazz musicians who became famous were drug addicts, but they didn’t become famous because they took drugs, they were great jazz artists. But just like today, shocking behavior got you noticed. One of the greatest jazz musicians of all time, altoist Charlie “Bird” Parker, and his inner circle of jazz musicians, were drug addicts. Many of Bird’s followers wrongly believed that they had to get high so they could play like Bird. Bird would be dead at the age of 34 because of his drug abuse. Fats Navarro, one of the greatest jazz trumpeters, died at the age of 26 from tuberculosis and complications from his heroin addiction. 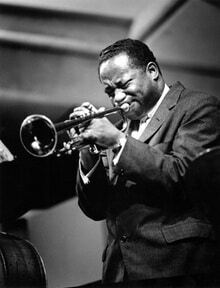 Bird and Fats are mentioned because they played a central role in the artistic life of Clifford Brown, fondly known as “Brownie,” one of the greatest jazz trumpeters that ever lived. Who you say? Yes, Brownie stands alongside the trumpet kings Louis Armstrong, Miles Davis and Dizzy Gillespie in the pantheon of the greatest jazz trumpeters of all time. If you are mildly aware of jazz history, you probably at least have heard about the first three trumpeters, but unfortunately it is doubtful that you know who Brownie was. From late 1951, before Brownie was 21, to mid-1956 Brownie played with the who’s who of jazz, many of whom were drug addicts. By 1953 he had extensively toured and recorded in the US and Europe and his reputation and fame were beginning to spread. By early 1954 he was co-leader of one of the most respected groups in jazz, being hailed as the next Dizzy Gillespie and winning the “New Star Award” in the Down Beat Critics Poll. After a whirlwind courtship he married in 1954 and before the end of 1955 Clifford Brown Jr. was born. By 1956 Brownie had it all, having ascended to the pinnacle of the world of jazz. Known as a caring, kind and warm person, both on and off the band stand, he was respected and admired by his peers and fans. He composed a number of tunes, two of which, “Joy Spring” and “Daahoud,” have become jazz standards, played and recorded by legions of great jazz musicians over the past 60 years. Brownie has been described as a brilliant and profound musician who never played a wrong note. He emerged over a four and half year period as a complete musician who had a virtuosic command of the trumpet, with a warm and pure tone, whether playing in the lowest or highest register of his horn. His technical prowess was remarkable, as he could play in an understated lyrical way or a “burning” way, articulating every note. He escaped the culture of drugs that surrounded him and that killed so many of his jazz contemporaries and always kept his focus on the music. So why don’t most people know who he was? Why didn’t he join Louis, Miles and Dizzy as a Trumpet King? He tragically died in a car accident before he was 26 and since there were no drugs, no scandals, no shameful or shocking behavior, he quickly disappeared from the front pages of the newspapers. His life was sadly cut short, but fortunately his music can still be heard and on the evening of Sept. 6, Vail Jazz will present Byron Stripling in his Multi-Media Tribute to Brownie at the Marriott Hotel as part of the 21st Annual Vail Jazz Festival.